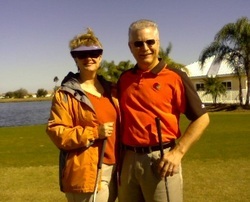 In April, 2010 Steve and I began planning for a trip around the country to find the place to relocate to for retirement. We sold our farmhouse and our rental property and gave away enough furniture to furnish a 6-bedroom house. We thought about places like Atlanta, Dallas, etc., but never "felt" like those were the places we were to be. We decided to take a pit stop in Port Charlotte, Florida and visit with some friends and family who winter there. Lo and behold, we ended up staying for 2 1/2 years. Our time in Port Charlotte, however, has come to an end and we are heading back on the road. ​We hope you will follow us as we continue to journey through this beautiful United States of America.